I had lots of snippets left over that were too small for card panels, so I cut them into 1" squares and cut some in half lengthwise and some in half diagonally. 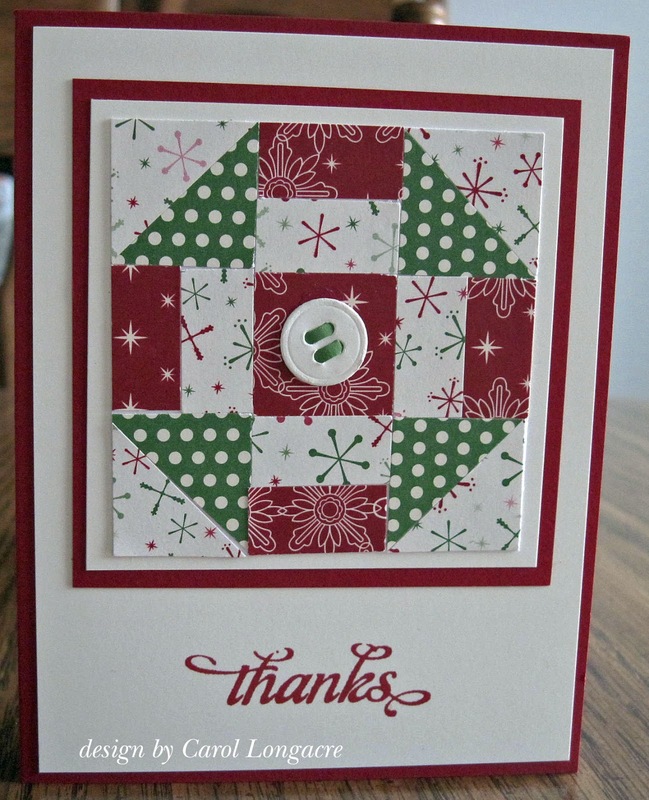 I pieced them together to make a little patchwork quilt and turned it into a Christmas thank-you card. The sentiment is by SU! and I added a die-cut IO button to the center, threaded with narrow strips of matching green cardstock. I'm sharing this with the Jingle Belles "thankful for the holidays" challenge. This was one of my most favorite DSP's from SU! 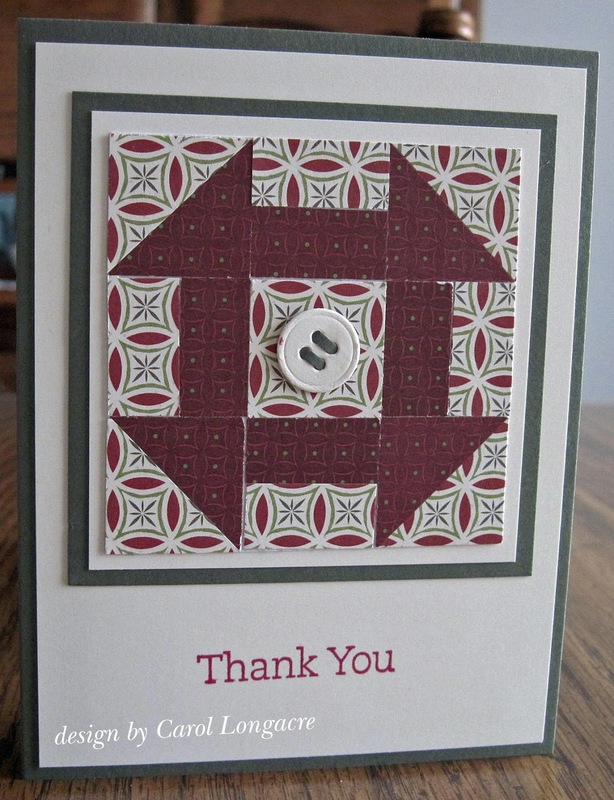 from years gone by, but none was wasted since I made these quilted thank-you cards. The sentiment is also by SU! Thanks for stopping by and do have yourself a fantastic Friday and a good weekend as well! You must be nearly done with your Christmas cards if you are already moving on to Christmas thank yous! These are lovely! The papers are so pretty and they look great quilted! You are always so clever, Carol!!! Such amazing use of snippets!!! Love your quilts", and especially the second one!Thanks for sharing your technique! Fabulous cards Carol, a brilliant way to use up your snippets. I love all these quilt designs. They bring back memories of the wonderful quilts my Mom used to sew up all the time. What awesome paper quilt designs ... so glad you got *grateful* with us at jingle belles. They are so pretty, Carol. Looks like someone needed a little paper therapy. Oh I love the "quilted" look/feel of these cards Carol! Will have to look thru my scraps as I think this would make great get well cards too??! Lovely quilted look. The button really keeps with the theme. Great way to use scraps on these lovely Christmas cards! I love your quilted cards. They are beautifully done and just finished off with the buttons. Such a great card! Awesome lettering for both cards!